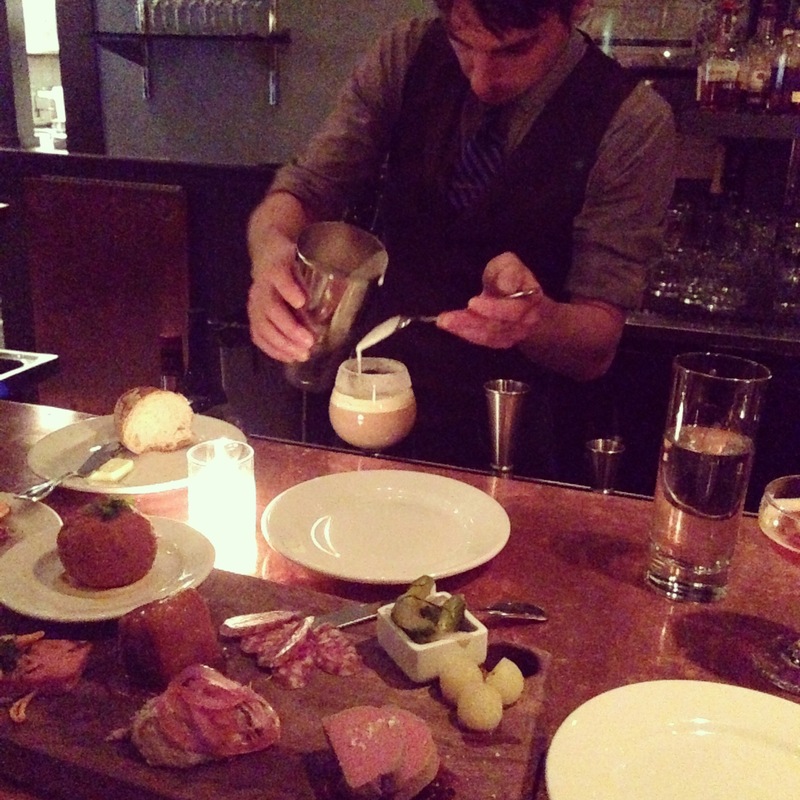 A month has gone by, yet I’m still craving some of the great meals that I had in Portland. If you love food, this town is serious about ingredients and giving them the respect they deserve before they end up on your plate. Whether it’s a lunch with beer and charcuterie, crazy flavor combos in doughnuts or artisinal ice cream, or a quick bite one of Portland’s many casual food carts, it’s hard to leave disappointed. 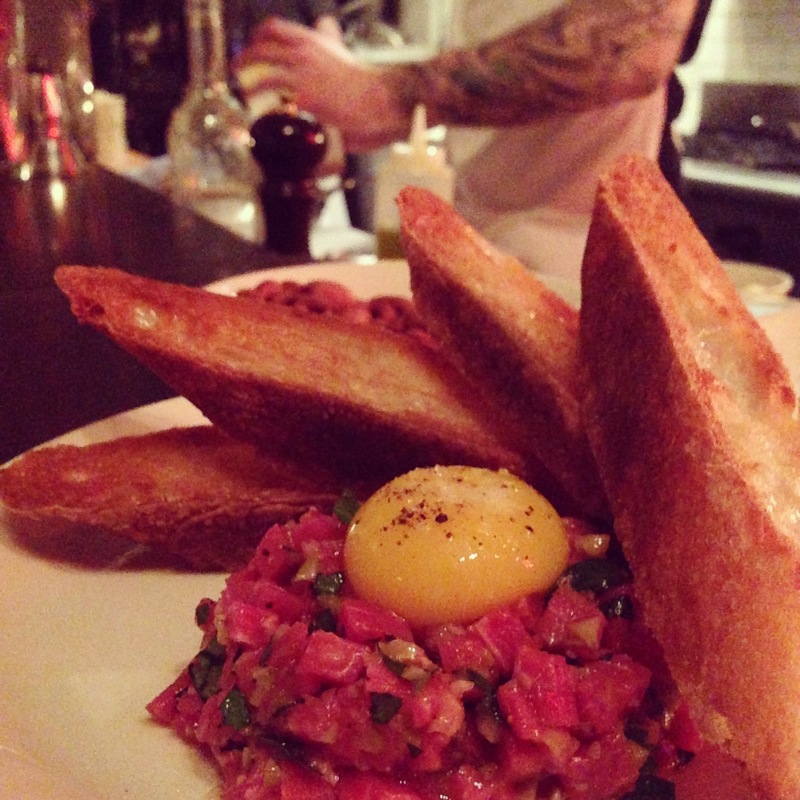 Little Bird Bistro and it’s big sister restaurant Le Pigeon came up on almost everyone’s list of recommendations for dining in Portland, inclluding Eater’s list of best deals for Portland Dining Month. While we originally planned on getting the Dining Month menu, it was close to the late night happy hour, so we opted to order ala carte instead. For excellent French bistro fare in a cozy setting, this was a great place to catch up with my classmate, Annebelle (of Pulehu Pizza) and to linger over cocktails and wine. This was my first restaurant in Portland, based on my cousin Daniel’s recommendation. 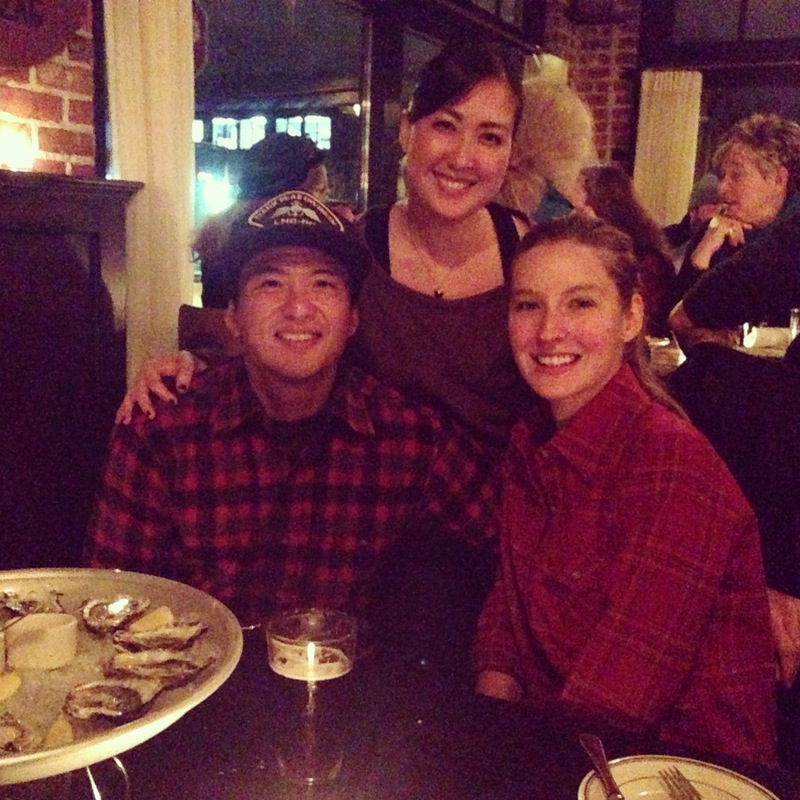 As you can see from the photo at right, I didn’t get the memo to wear plaid as an homage to the Pacific Northwest. I said that jokingly when we first arrived, but in reality there were references to lumberjack culture everywhere, including on the menus. To get into the spirit, I started with a cocktail called The Hunting Vest (charred cedar campari, rye & vermouth) which warmed me up right away. Just about everything we ordered was excellent, but I think the highlights were the platters of Pacific NW oysters from the raw bar, NY steak with marrow butter, the american ham selection, and the cheeky cocktail names. Just about everything is local and brought in from artisinal purveyors as much as possible and the staff is well versed in sourcing for just about everything on the menu. A bit pricey, but worth it. 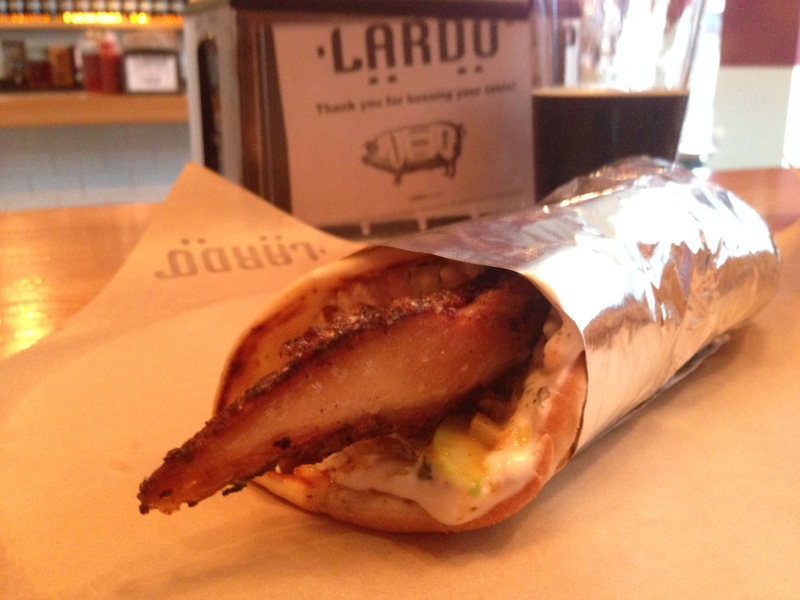 Lardo was another “no brainer” stop because we had gotten so many recommendations for it. When my beer-loving friend Edwin came to meet me in Portland, we chose Lardo to start off a day of beer tasting in Portland with a substantial lunch. Edwin opted for the Smoked Coppa Cubano and I loved my Pork Belly Gyro. For sides we got the Dirty Fries (pork scraps, marinated peppers, fried herbs and parmesan – sooo good!) and Pickled Vegetables. In a city with such a huge variety of local craft breweries and a menu full of meat-filled sandwiches, it only makes sense that the beers on tap would be tasty compliments to our lunch. I opted to go with the staff recommendation of a local IPA while Edwin got a Pinup Porter and we were both pleased. It was the perfect start to our afternoon! Olympic Provisions happened after a looong, rainy day of beer tasting on the Southeast side, and although one of the things I hate the most when I’m traveling is to head somewhere just because it’s close, in this case we were delighted to find a warm seat at the bar just a few blocks from Hair of the Dog brewery, our last beer tasting stop. It turns out that our perch at the edge of the bar was actually a fantastic vantage point for watching the chefs plate up dishes as we ordered a few small plates and some excellent cocktails. Highlights were the steak tartare and the french cheese & charcuterie board, although the dinner menu had so many tempting dishes, it will definitely be a repeat stop on my next trip. Voodoo Doughnut was probably the first foodie stop to come to mind before I visited Portland because I’d been hearing about the infamous maple bacon doughnuts for years. It’s so popular that local brewery Rogue even makes a Voodoo Doughnut beer. I’ve had the beer, let’s just say the doughnuts are better. 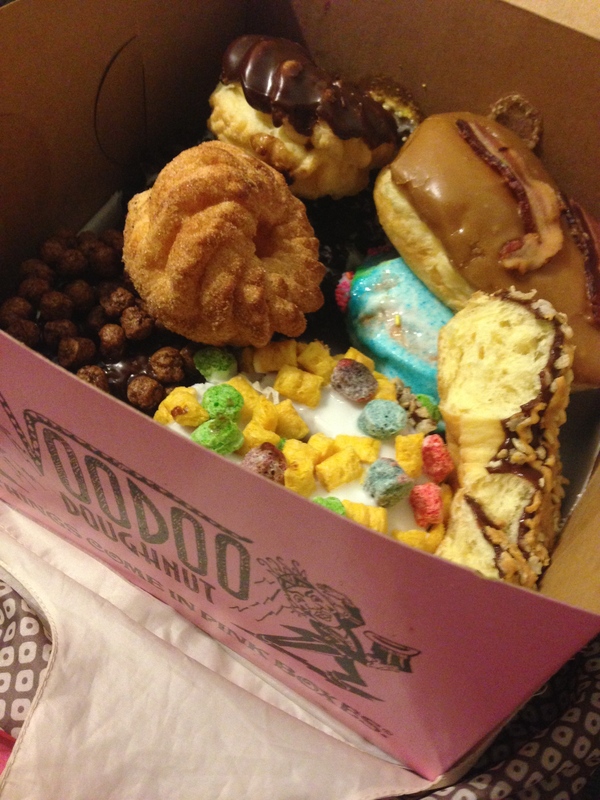 I happened upon the SW location of Voodoo Doughnut on my way to meet up with friends from Portland who had never had one, so I decided to pick up a variety pack. (Tip: If you let the staff pick for you, a dozen doughnuts will set you back only $13. If you choose for yourself you pay ala carte by the piece.) I don’t have much of a sweet tooth, so I really just tried a bite of some of the others and they were okay to me, but the maple bacon bar was good. The line is always out the door but it moves pretty quickly. Cash only. We couldn’t decide at Salt & Straw, so we made a tasting flight! 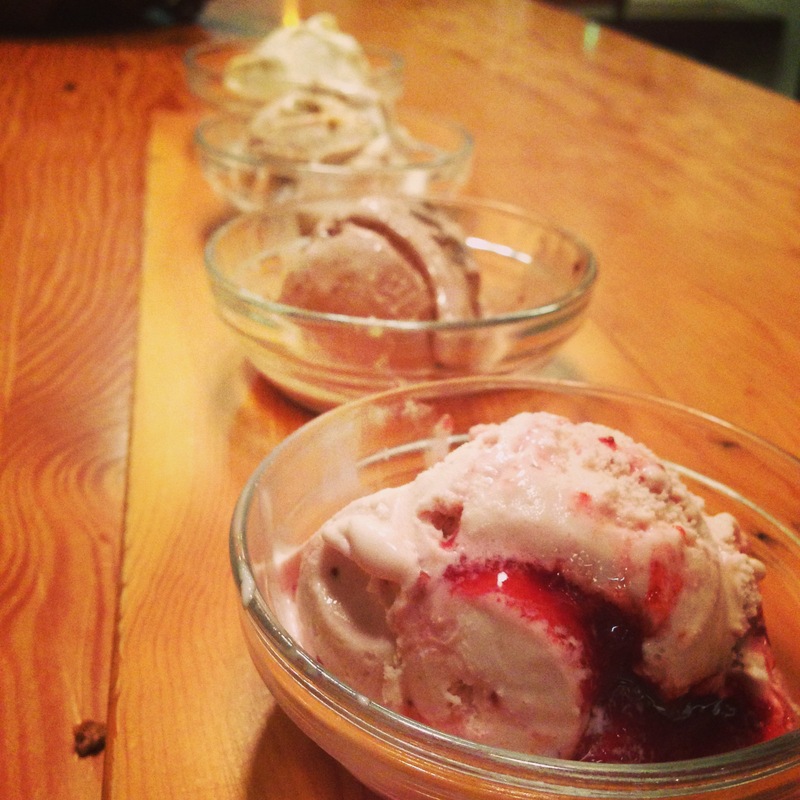 Salt & Straw is like ice cream mecca for foodies. They’re known for their not-TOO-sweet base that allows unique culinary flavor combos to shine through – like beer & bacon or the ever popular olive oil, which is supposedly one of Oprah’s favorite things. There’s almost always a long line but we lucked out by getting there just before closing so we didn’t have to wait at all. You are able to sample as many flavors as you want, and we opted for a 4 scoop tasting flight since we couldn’t make up our minds after trying so many. In the end we got “Spicy Monkey Banana Walnut” which is made with chili pepper vodka-candied walnuts, sea salt w/ caramel ribbon, pear & blue cheese (one of my favorite combos on pizza, salads, and now – ice cream!) but my favorite flavor of all was strawberry honey balsamic vinegar w/ cracked black pepper. It sounds strange to add pepper to your ice cream but trust me, it works like magic to bring out the berry flavor. Highly recommended!